On a cold September morning in 1844 a young man from Bavaria stands on a New York dockside. Dreaming of a new life in the new world. He is joined by his two brothers and an American epic begins. 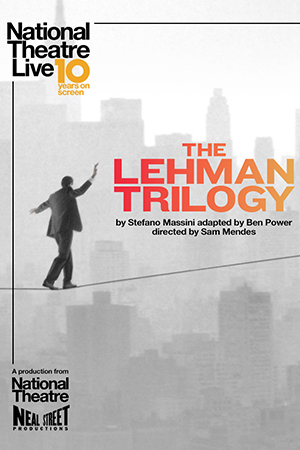 163 years later, the firm they establish – Lehman Brothers – spectacularly collapses into bankruptcy, and triggers the largest financial crisis in history. This critically acclaimed and five-time Olivier Award nominated play features stunning set design from Es Devlin (NT Live: Hamlet) and will be broadcast live from London’s West End as part of National Theatre Live’s 10th Birthday season. Members get loads of benefits including discounts at the box office & bar and no booking fees. Classic membership costs £29 and includes two tickets, so it’s basically free!